John Loeffler and Tom Read (www.tomread.info) discuss DACA on today’s ‘It Seems to Me’ commentary program. ‘It Seems to Me’ is a weekly radio commentary hosted by veteran broadcaster Tom Read, airing on the American Christian Network. 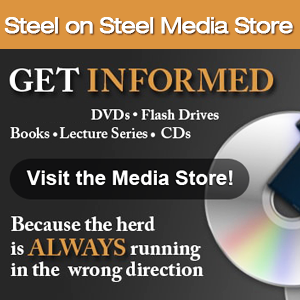 Subscribe to listen to other full Steel on Steel episodes, including the Section 6 Intelligence brief, and more! Follow us on Twitter @steelonsteelpro as well as the Steel on Steel Facebook page and remember to join Praying for Persecuted Christians for the latest information concerning persecuted Christians around the world. Don’t forget to stop by our YouTube channel as well for our latest videos. It seems to me.. Listen to all the goings-on in Washington! Listen to all the goings-on in Washington: raising the debt ceiling, taxing the rich, eliminating deductions for corporate jets. Wow! You’d think something really important was going on in congress! Well I guess we should be impressed. The Democrats have agreed to 4 trillion dollars in spending cuts over a ten year period; and they’re promising that nobody’s going to touch Social Security or Medicare. Well that’s a start. You see, if we divide 4 trillion dollars in cuts over 10 years and annualize it and compare it to the 1.5 trillion dollars we’re spending every year into debt; that’s less than a third of the shortfall every year. We need to get rid of all the deficit spending; but that is no longer possible. Congress is too committed to too many programs to do that. The U.S. already owes 15 trillion dollars and do you realize if you spent a million dollars a day since the day Jesus was born you still wouldn’t have spent the amount of money that the U.S. government is in hock? The reality of the situation is that the United States is rushing towards the mother of all economic storms and the politicos won’t tell us the truth, nor will they take the hard steps to minimize the impact of this inevitability. Everything, including Social Security and Medicare and the new healthcare will all be affected. This economic storm is just months away; it will be far greater than the subprime mortgage crisis of 2007 and pastors need to pray about and begin preparing their congregations for that time right now. I’m John Loeffler at steelonsteel.com and that’s how it seems to me. Do You Trust the Trust? The Middle East chessboard has been rapidly changing due to the so-called Arab spring, which seems to be forming, in reality, an Arab winter. The governments of countries surrounding Israel are increasingly being taken over by groups hostile to Israel. In Lebanon, in the north, the terrorist group Hezbollah now has control of Lebanon’s government instead of just control of the southern border of the country. Along the south in Gaza, the terrorist group Hamas has free movement of materials like war supplies and; Hamas is now a major partner in the peace negotiations if you can call them that. In Egypt itself, the elections in September have a high probability of putting in power representatives of the Muslim Brotherhood, which means that Egypt will become increasingly hostile towards Israel. You see, at a time when the threat level against Israel is rising rapidly, instead of standing with Israel, the Obama administration is badgering Israel into accepting the old, indefensible pre-1967 borders as a starting point for restarting the long-dead peace process. But how can you even restart a peace process, when one of the negotiating partners, Hamas, refuses to reject its call for the destruction of Israel? The world itself is heading towards a major energy crisis and conflict in the Middle-East region which will involve most of the first world countries. If there ever were a time to pray for the peace of Jerusalem this is it. Whatever Happened to the Peace Process? I’m John Loeffler at steelonsteel.com, here’s how it seems to me. Every time we hit high oil prices Congress jumps into action, holds hearings and does…uh, nothing. Right now the United States is plowing into a major global energy storm, totally unprepared to face it with a feeble energy policy. Almost ten major studies have been done showing that the world’s daily demand for oil is exceeding the amount that we are producing; and this situation goes critical by about 2014 or ’15. It’s just months away, meaning that there’s going to be a major worldwide shortage of oil. If you think prices are high now, wait until it hits seven dollars, ten dollars. Now we didn’t have to be in this condition, for years we’ve been painting ourselves into an energy corner by refusing to exploit our own national resources. The world energy market is huge! U.S. oil companies only represent about 15% of the total world market; and contrary to what you hear about record-breaking profits, oil companies only make about a 5% return on their investment. The day of cheap oil is over. So what is Congress doing as the storm approaches? Well I guess they’re holding hearings, right? But the next time Congress critters tell us about the evil oil companies, you might want to point out to them that the biggest profiteer at the pump is government. They make more in taxes from every gallon sold than the oil companies do in profit.